It would be something of an understatement to label D.W. Griffith’s American Civil War epic, The Birth of a Nation (1915), as controversial. The film became infamous due to its overt racism and negative stereotypical portrayals of African-Americans, coupled with the rampant glorification of the Ku Klux Klan, causing widespread outcry. Such was the strength of the reaction against it that Griffith was driven to produce Intolerance (1916) the next year, partly as a response to heavy criticism. This was not before the KKK had embraced the film and its sources as inspiration for the organisation’s resurgence. This is a film littered with dualities: two families (the Stonemans and the Camerons) in parallel interconnected stories; two opposing sides of the war; two races in conflict. The film’s structure reflects this with the narrative cleaved into two parts – one presenting America before and during the war, and the other concerned with the post-war union. The greatest duality of all is the juxtaposition of morality and quality. 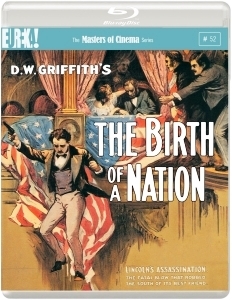 Given its unsavoury themes and racial politics, one might expect The Birth of a Nation consigned to the celluloid scrapheap, yet Griffith’s film is also an extraordinary and groundbreaking piece of cinema that has deservingly received a beautiful high definition transfer courtesy of the Masters of Cinema series. Despite opening with a pernicious title card that asserts “The bringing of the African to America planted the first seed of disunion”, Griffith’s film is a marvel, brimming with new ideas and techniques that have gone on to inform generations of filmmaking practice. Notions that are commonplace to modern audiences were pioneering advances in this era with the film utilising things like panning camerawork, panoramic wide shots, and close-ups for additional emotional engagement. The scenes of battle are spectacular, and the use of cross-cutting between different characters to build tension another impressive progression. The dramatic impact of The Birth of a Nation remains exceptional, even today. One particular sequence in which a woman is pursued by a lascivious mulatto (a Caucasian actor in blackface) through the forest ratchets up the tension to an unbearable degree. There is no doubting the anti-war message underlying the opening segment, either, as friend kills friend and embryonic flashbacks are poignantly adopted for the remembrance of fallen brothers. White supremacist ideology comes crashing through more forcefully after the death of Lincoln though. As the Stonemason patriarch (played by Ralph Lewis and clearly based on Thaddeus Stevens) makes all men equal, the empowered African-American characters prove themselves to be amoral and wear perpetual lecherous smirks as they leer at pallid southern belles. Griffith’s The Birth of a Nation is understandably difficult to swallow, but similar to the work of Leni Riefenstahl, it’s more difficult still to ignore the outstanding quality on show despite its deplorable ethics.